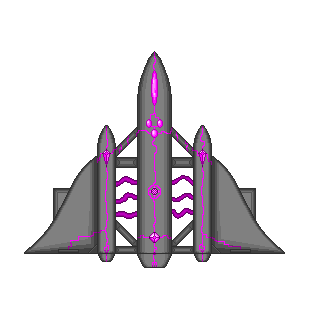 The boss of Level 3 will be a large battle cruiser that releases a new type of enemy, the Kamikaze fighters. They will suicide into your walls and buildings to blow up an area around them dealing massive AoE damage. The boss is a new class of 'Elite' enemy that will likely show up around the end of waves as minibosses and bosses. There will be other bosses later as well, but this guy is going to be seen more. This small guy packs quite a punch. I drew inspiration from the scourge from Starcraft 1. They will rush you down quickly but have little health. If you can kill them before they hit you it'll be good to save your towers. In conjunction with the Sabo type enemy, these can wreck through your defenses. - Turret Upgrades: Currently there are 4 turrets (Gun, Missile, Flame, Laser) and these four will upgrade into (Sniper, Barrage, ShadowFlame, Ice Laser) respectively. In the info tab you can mouse over the upgrade button to see their costs and either click the Arrow Button or press 'U' to upgrade your turret if it is available to do so. I have activated the Sniper Upgrade in Level 3, so if you have extra gun turrets around, upgrade em to the long ranged sniper turret! - New Generators: I have added 2 new Generators the Quick Generator (reduces time between shots) and the Heal Generator (Heals linked turrets and self over time). Also later on I will add generator upgrades for each of the generators. Also I think I might take out the expanded generator and make that an upgrade instead and make it a bit more powerful. That would make room for another cool generator (like a +Range gen). - Level 3 Boss: The boss will be done soon and I'll have a new file once I get all the bugs and kinks worked out. I also still need to add his main weapon: A rocket launcher to the top of him. ALSO: Beware! The boss will destroy any walls he flies through! His hitbox is too large for the pathing system to work right so he just plows right through any buildings in the way! I will probably add a small amount of damage back to him when he does so. This guy is big but not so bright. I have things set up to pound out Level 4 once I finish up the boss! With 2 new enemy types Level 4 should be a fight! I might mix things up too and vary the game a bit from the basic base defense. Subscribe to the blog for updates and special releases!